/ Comments Off on Why Is My Garage Door Opening By Itself? Every so often someone will come to us bewildered and frustrated, saying that their garage door has been operating on its own at random. “I was sitting in my kitchen having breakfast with my family,” they say, “and all of a sudden I hear the garage door open, completely on its own.” Other times, frantic homeowners will say that they have returned home from vacation to find that their garage door has been open for days. There are few things worse than losing the peace of mind and secure feeling of having a functional garage door opener. Having your garage door open when no one is home can be a huge security risk, and messing with buttons and wiring can be frustrating, especially if the opener still malfunctions after your best attempt to fix it. 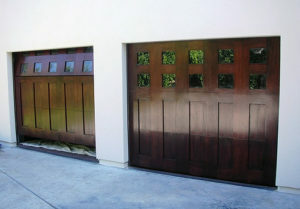 Garage door openers, especially old ones, can be triggered by a number of things. Some people think it’s from their neighbor’s garage door opener. This is true only in rare cases, though. Here is what may be causing the problem and how you might be able to solve it. One common cause comes from doors manufactured before 1993. These doors have a photoelectric system that act as a safety mechanism. This can get misaligned though – the two sensors can get out of align, the beam cut off, and the system interprets this as an object in the way of the door closing. This can cause it to reopen. This can be fixed by realigning the beams. If you check the wall panel by your home’s entrance, you may see an indicator light that’s blinking. You’ll know this is fixed if that light stops blinking. During snowstorms, you may get snow or ice buildup along the door’s threshold. If your door has a sensitive mechanical system, this buildup could cause the door to reverse and open on its own. Has there been a thunderstorm, windstorm, or something else that triggered an electrical surge? These can damage the transmitter’s electrical wiring and cause the garage door opener to open at random times. If a lightning storm has damaged the electrical circuits, you’ll likely need the assistance of a professional. For a quick professional inspection, call us at (503) 730-0444. One common issue is the button on a remote or wall mount that becomes stuck. If you peek at your opener unit, look for the “learn” button. If the light next to it is flashing, then one of the buttons is stuck. For this, remove the batteries from each remote to find the faulty button – you may need to replace the remote. If this doesn’t work, shut off the electrical circuit connected to your garage door opener on your electrical panel. However, make sure it doesn’t share a circuit with anything else important! When you leave, it’s nice to know for sure that your door won’t open by itself. To make sure of this, inspect the wiring at the wall mounted button and look for damage. If you don’t see a short in the wiring, then it’s likely that the unit needs to be adjusted, repaired or replaced. In any event, give us a call at (503) 730-0444 or contact us online and we’ll have your garage door opener working properly in no time.